Following a 43-24 victory over the Cornish Sharks, the Saints travelled to Torbay to take on the Trojans. Despite a 3 hour coach journey the team arrived feeling fresh and ready to compete, coming away with a huge 72-30 victory. The Saints were also honoured by a large number of supporters who travelled to see the team in action. 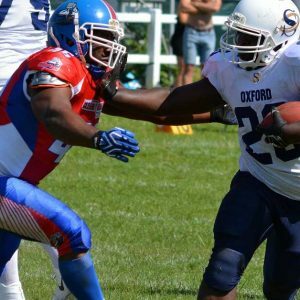 Oxford broke another one of it’s own records by scoring the most points in a game since a 74-0 beating of the Andover Thrashers in June 2005. 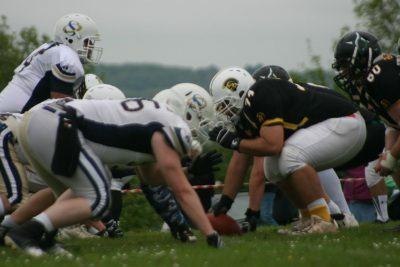 Earlier in this season, Oxford broke it’s record for ‘largest comeback from behind for a win’ when the Saints narrowly beat the Bristol Apache on 26th April, after being down 22 points at half-time. 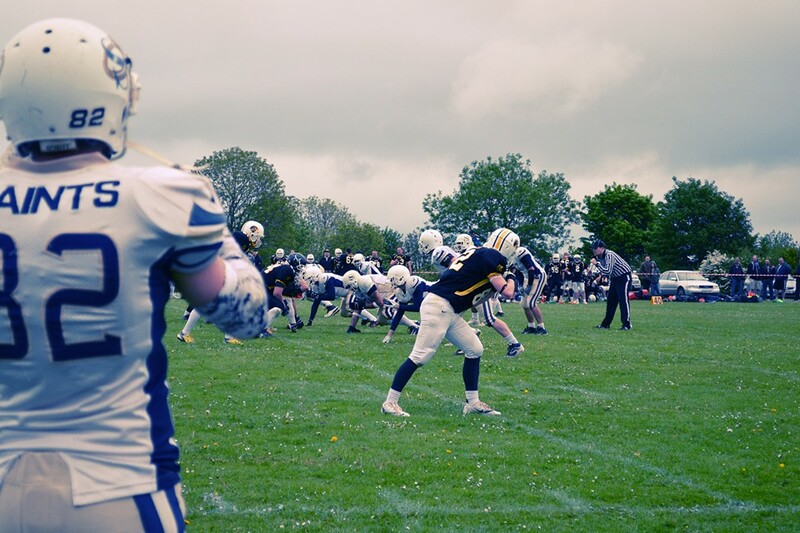 At the beginning of 2015, the Torbay Trojans visited Oxford for the season opener. Despite a bumpy and slightly unimpressive performance, the Saints claimed a 18-6 victory over the visitors. The Trojans won the coin toss and received the ball to start the game. Quarterback Aaron Butler led his offense onto the field and picked up a first down on the opening drive. Butler proved to be a threat in the air and on the ground in the last contest, with quick feet and being able to run the ball competently himself. The Saints defense put him to the test early on but the Trojans only needed an extra 2 yards to pick up another 1st down. Strong defensive play by linebacker Calvin Holmes stopped their momentum with excellent back to back tackles on two rushing attempts by Torbay, taking the ball carrier back 4 yards on their 4th down attempt. Oxford quarterback Ben Denton took over and led a quick scoring drive. Handing the ball to running back Kev Brooks, he picked up 54 yards on 5 carries and rushed the ball in for the first score of the game. Spencer Duffy’s extra point kick was good and the Saints took the lead, 7-0. Looking to answer back, Aaron Butler was quickly shut down on his next drive when Saints cornerback Mike Turner intercepted a pass and returned it 35 yards up the sideline for another score. Turner has now returned two interceptions for touchdowns this season already, with his first coming in the spectacular comeback victory over Bristol. 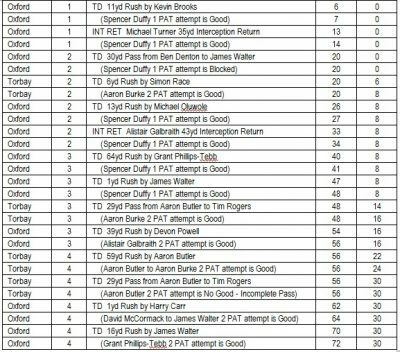 Duffy added another extra point. 14-0 Oxford. 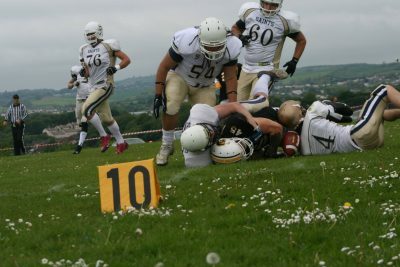 On their following drive, Butler and the Trojans found themselves in great field position after an explosive run by James Lunt, who raced up the field for 32 yards before being brought down by defender Michael Bearman. With the Trojans knocking on the door, the Saints found themselves pushed back in their own end zone. Butler attempted to find his first score in the air but tight coverage by rookie Tom Hemming and the rest of the Saints defense gave the Trojans nothing. Just a few yards away from the end zone, veteran linebacker Dean Bryan intercepted Butler and put an end to the threatening Trojan drive. With the Saints back in possession taking over from the 9 yard line, the offense put together an impressive drive marching down the field. On the first play, Kev Brooks broke through the defenders and picked up 39 yards. 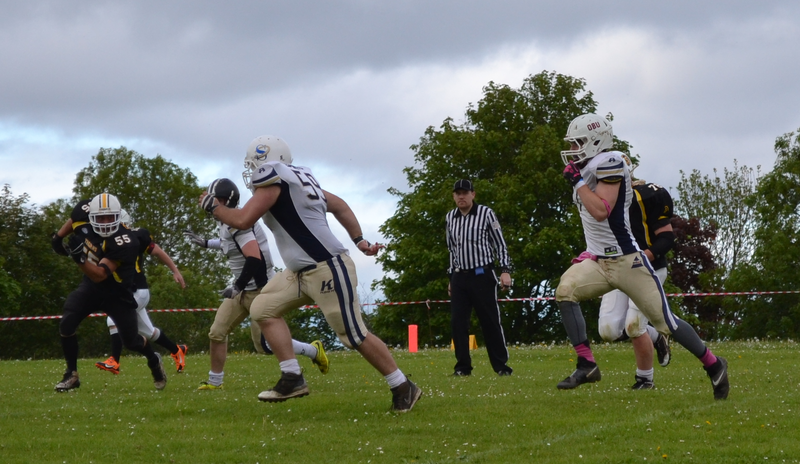 Strong running from Brooks and James Walter got the Saints in scoring distance but unable to pick up a first down. Ben Denton attempted a pass from 17 yards out and targeted receiver Leroy Holmes but it was incomplete and the ball was given back to the Trojans. With the Oxford defense giving nothing away on the next drive, the visitors were forced to punt, setting up a quick scoring drive for the Saints. On just the 2nd play of the drive, James Walter was on form as always. Before the ball was snapped, Denton read the defense and spotted that Walter was uncovered. He threw a quick pass to Walter who then charged 30 yards into the end zone. The extra point kick by Duffy was blocked, 20-0 Oxford. The Trojans returned to their ground attack and their running backs started to move the ball well against the tough Saints defense. After moving across the field, Butler handed the ball to Simon Race who ran in from 6 yards for the score. The Trojans went for the 2 point conversion and Aaron Burke successfully crossed the line. 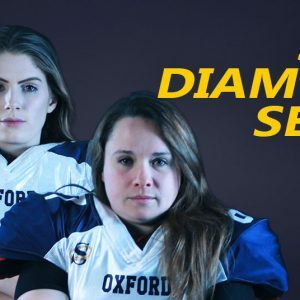 20-8 Oxford. The Saints answered back promptly in the form of veteran running back Mike Oluwole. With his powerful running, Oluwole was handed the ball and charged through the Trojan defenders picking up 44 yards on 4 carries. 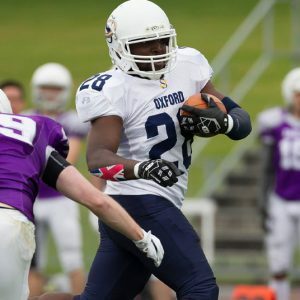 Oluwole quickly smashed his way into the end zone for a 13 yard score and a successful kick by Duffy extended the lead, 27-8 Oxford. 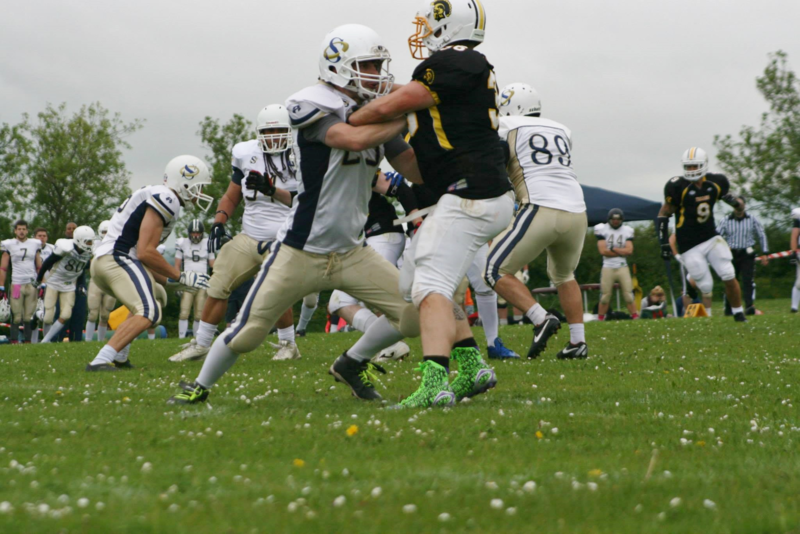 Still in the 2nd quarter, a pass by Butler was intercepted by veteran defender Ali Galbraith who raced the ball back into the end zone from 43 yards to add on another Saints score, claiming his first defensive touchdown of his career. Butler attempted to force the returner out of bounds but Galbraith sidestepped him and avoided the would-be tacklers as he crossed into the end zone. Duffy’s kick was good, 34-8 Oxford. On their next drive the Trojans continued to move the ball well on the ground. 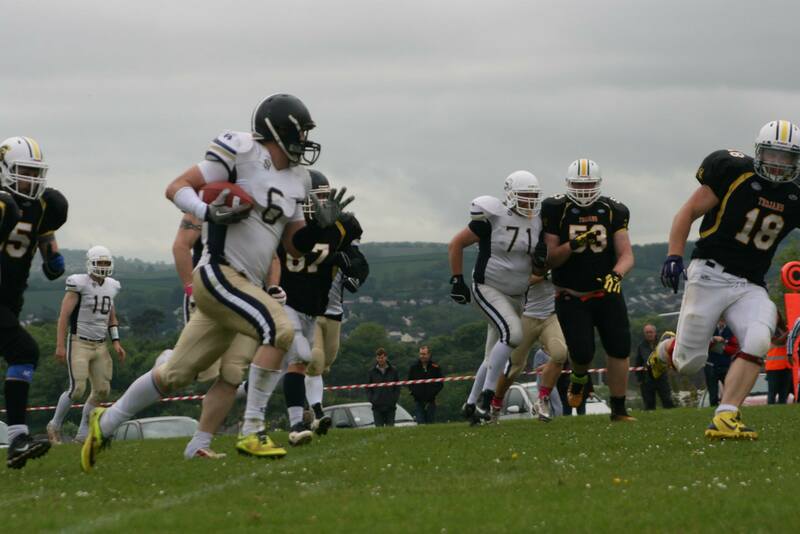 Defenders Galbraith and Matt Wheeldon took down Torbay running backs who were picking up good gains on the outside. Butler showcased his dangerous mobility and made a good run up the sideline, before being dump tackled by Wheeldon. After leading his team to the 19 yard line, Butler and the Trojans were in good position to add another score. Butler dropped back to pass and then looked to wheel out to the left. 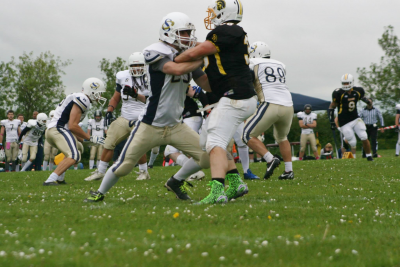 Strong tactical play by defensive end Adam Baker sealed off the outside and discouraged Butler from taking off, forcing him back into the pocket. 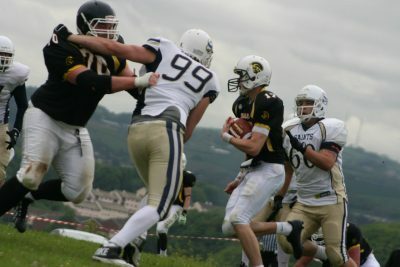 With pressure closing in, Butler attempted to throw the ball just as the towering rookie defensive end Conor Whitehouse hit him in the back. This sent the ball uncontrollably into the air and it was defensive tackle Toby Durant who made a stunning one handed grab to reel it in, whilst fighting off a Trojan lineman with his other hand at the same time. Denton and the offense took over and the ball was handed off to veteran running back Harry Carr, in his first appearance with the team after signing back on for the 2015 season. Carr picked up 20 yards on the ground before a pass from Denton intended for receiver Jake Geerthsen was intercepted by the Trojans to bring an end to the 1st half. 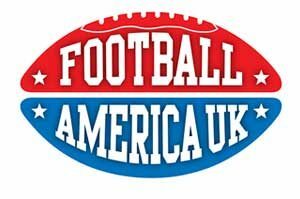 34-8 Oxford but due to the score margin, league rules for 2015 require a “running clock” whenever a team is 35 points in the lead. The Saints received the ball to begin the 2nd half. 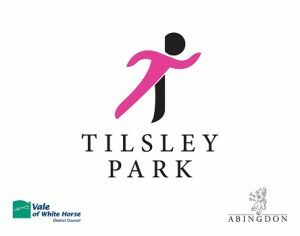 On the first play of the drive, Denton handed the ball to Grant Phillips-Tebb who bolted all the way up the sideline for a 64 yard score on his first carry of the day, marking his first touchdown with the Saints. Duffy remained solid kicking the extra point, 41-8 Oxford. Back on offense, the Trojans continued to look for gains on the ground. Duffy came on the field at the linebacker position and tackled the ball carrier twice. 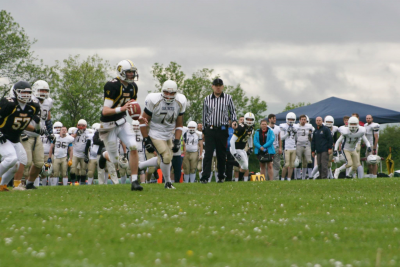 Quarterback Aaron Butler ran the ball himself towards the sideline and picked up a first down before being tackled out of bounds by defender James Dunstan. Another run play was tackled out of bounds by Dunstan followed by a big sack on Butler by Toby Durant charging through the middle. 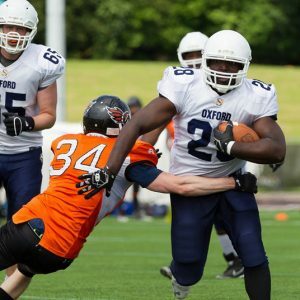 The ball came loose and defensive end George Wright dived on the fumbled ball to recover it for Oxford. This led to another quick scoring drive, with strong running by Rob Johnson picking up 20 yards, setting up a 1 yard touchdown for Walter as he crossed the line. Duffy adds the extra point, 48-8 Oxford. With a big lead, Oxford were able to cycle in a range of players on both sides of the ball but the Trojans quickly answered back when Butler rolled out and threw a 29 yard touchdown pass to receiver Tim Rogers, who was open in the corner of the end zone. Aaron Burke ran in for the 2 point conversion, softening the blow to 48-16. The Saints kept the foot on the gas however and it was Devon Powell who was to cross the line next for Oxford. Taking a handoff from Denton, the sprinting Powell raced up the sideline on a reverse play untouched into the end zone for a 39 yard score. 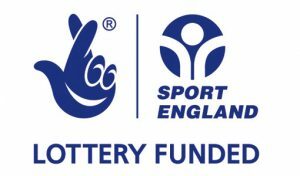 Duffy lined up to attempt the extra point kick but it ended up being Ali Galbraith who picked up the ball and ran into the end zone, scoring 2 points instead. Early in the 4th quarter, Aaron Butler took off and ran the ball in himself for a 59 yard score. Butler then passed to Aaron Burke who scored the 2 point conversion. 56-24 Oxford. Soon after the Trojans benefited from another touchdown pass from Butler, this time for a 29 yard score to Tim Rogers, who claimed his 2nd touchdown of the day. Butler went for the 2 points and looked to pass but it was incomplete. 56-30 Oxford. With Saints 2nd string quarterback David McCormack at the helm, the offense marched up the field once again and picked up 5 first downs. Walter picked up 48 yards during the drive and running back Troy Bryan was back on the field for the first time after suffering an injury in pre-season and was performing well. With the offense entering Trojan territory, a handoff to Walter was fumbled and hit the floor. Walter reacted quickly and scooped it up and scrambled his way through defenders and up the sideline for a impressive 28 yard gain, setting up a 1 yard touchdown run from Harry Carr. This was Carr’s first touchdown with the Saints in 2015, and David McCormack’s first touchdown drive at quarterback. McCormack then passed the ball to Walter who added the 2 points, 64-30 Oxford. With time in the 4th running down, the Trojans looked to add another score to the board but a fumbled ball on the first play of their drive was recovered by Conor Whitehouse. This brought McCormack and the offense back out onto the field for one more time, which saw Walter continuing to wreak havoc. Walter gained 25 yards on the ground before running into the endzone for a 16 yard score, his 3rd of the day. To cap off the offensive scoring, Phillips-Tebb took the handoff from McCormack and ran in the 2 point conversion, 72-30 Oxford. In the final moments of the game it was looking like a trick play by the Trojans may result with them going out on a scoring play but it wasn’t to be. Aaron Butler handed off the ball and then rolled out up the sideline catching a pass from his own teammate. As he entered space, it was rookie defender Joseph Limerick who closed him down and landed a perfect open-field tackle on the fleeting quarterback. 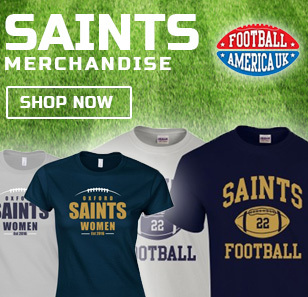 With a record breaking win, the Saints now sit at the top of the division with a 4-1 record. They have three weeks of training to prepare for their next contest which is a road game to the Bristol Apache on 21st June. On offense, James Walter led the day with 121 rushing yards on 8 carries with 2 touchdowns. He also caught 2 passes for 35 yards and a 3rd touchdown. 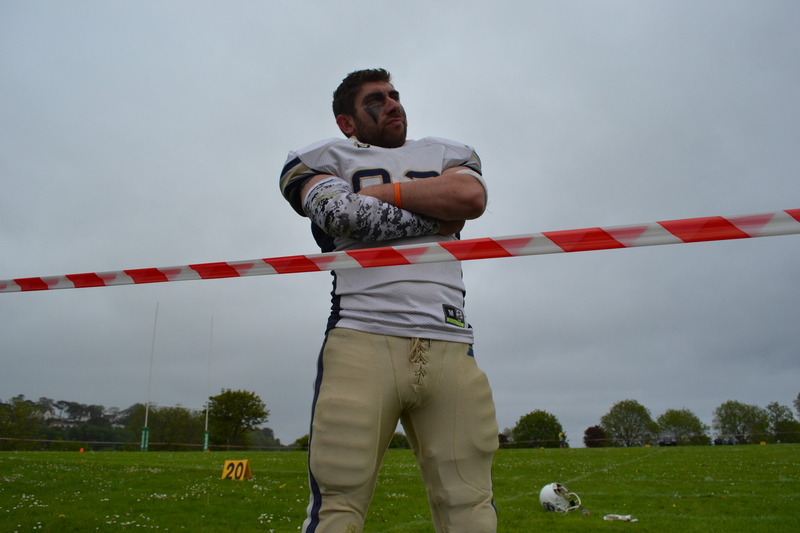 On defense, Michael Bearman and Dean Bryan contributed the most tackles with 5 each. Interceptions came from Mike Turner and Ali Galbraith, who both returned them for scores. 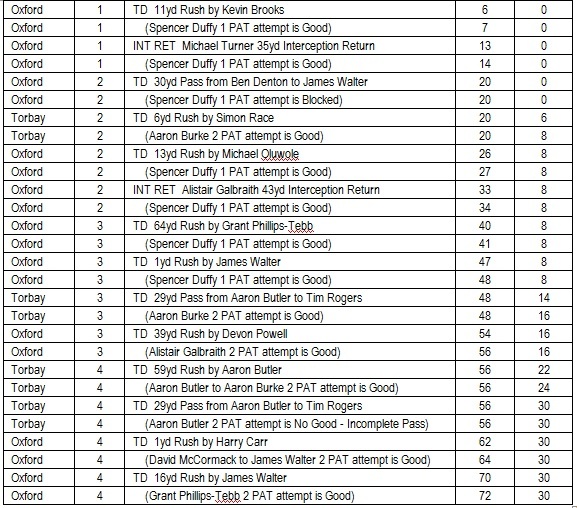 Dean Bryan and Toby Durant also added interceptions. The Saints picked up 490 yards on the ground and 35 yards in the air. The Trojans gained 320 yards on the ground and 112 in the air. Unable to capitalise on the gains prevented the hosts from increasing their score, with only 2 rushing touchdowns and 2 touchdown passes. 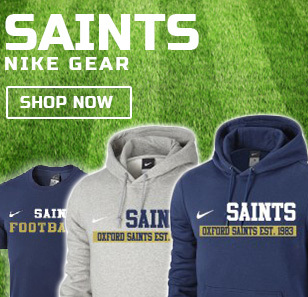 Meanwhile the Saints scored 7 touchdowns on the ground and added a further touchdown in the air. The Saints managed to build momentum early and then added pressure to the Trojans with strong defensive play, recovering 2 fumbles and and snatching 4 interceptions.